Five years after they were first commissioned, two of South Yorkshire's four new fire trucks have finally taken to the streets. The fire service bought the Combined Aerial Rescue Pumps (CARPs) in 2006 at a cost of £2m, but they were too heavy to be used legally on the roads. It had to send the trucks to the Netherlands to be modified at an extra cost of £700,000. Two of the CARPs were used in Barnsley and Doncaster last month. The trucks are designed to both fight fires and act as an aerial rescue platform. Jim Andrews, chairman of the South Yorkshire Fire Authority, said the engineering company that built the trucks went into administration before they could fix the problem. "We had to look around for another company that could actually fix the problem," he explained. Although the structural problems have been fixed, the Fire Brigades Union (FBU) has previously raised concerns about the CARPs. Graham Wilkinson, chairman of the FBU in South Yorkshire, told the BBC in August 2010 his members would view the new trucks as a "cutback in services". 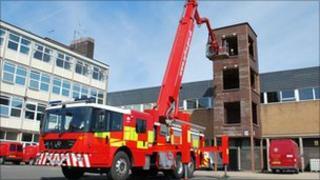 They would rather keep the aerial rescue platform and fire appliances separate, he said.